Stretching anywhere from eight to twelve feet (244 to 366 cm) from tip to tip, the wingspan of the wandering albatross (Diomedea exulans) is the largest in the bird world. This giant gypsy of the Southern Ocean spends most of its life in flight, soaring nearly effortlessly across vast distances of open ocean each year. 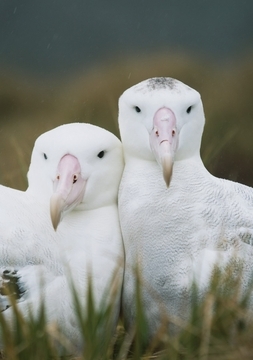 Breeding pairs mate for life, nesting every two years on islands just above the Antarctic Circle. Usually the male and female take turns sitting on the nest, but in this case they’ve opted to cozy up together.